Halloo takes it a step further with its virtual phone system, and completes its VoIP service with an integrated contact management system. 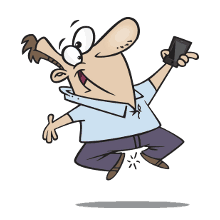 Through easy to use software, you can easily manage all incoming calls and messages and view a calling history of all your contacts. By taking advantage of their 800 toll-free number service, you can set up an alternate phone number for your company complete with an optional vanity number to keep your company in the mind of public consciousness. 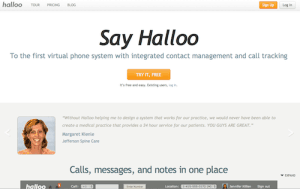 And perhaps best of all; Halloo features an entirely free plan with a local number and up to 500 calling minutes. Halloo’s biggest draw comes from its ease of use. A 30-day free trial is available, allowing you to get your VoIP service and phone number up and running in just a couple of minutes. By using their customizable toll-free number option, you can actively change how your company is perceived by your own clients, giving them the confidence that you are a true professional. Additionally, Halloo offers a virtual office service that keeps you in contact with mixing calls, whether that be through routing calls to your mobile, office, or home telephone. They also send you text messages and emails should you still be unavailable. With Halloo you don’t need to worry about missed sales because no one was able to answer a call. Halloo can be useful for anyone: for companies it obviously has value as a virtual office while also enhancing the company’s image. It’s also good to have Halloo for you as a virtual assistant when you find yourself too busy in your day-to-day to be constantly taking phone calls, and finally it’s good to have Halloo for groups when you need everyone to stay connected and coordinated. Companies wanting to expand their inside sales force or customer care team, the FlexCall Center plan and its sturdy features will be a great fit. Halloo has a number of different pricing plans depending on whether you’re getting Halloo for groups or yourself. The first plan available is entirely free, and lets you call 100-500 minutes per month with three users in total. Just like the paid plans, the free option comes with a local number. The Biz package starts pricing at $4.95 a month for 100 included minutes, with 300 minutes for $9.95, and caps out at $19.95 a month for 2,000 included minutes. For businesses relying heavily on their back office force, there’s the FlexCall Center plan starting at $199.95 per month boasting full-blown call center features such as true ACD call queuing and supervisor monitoring tools. Halloo supports its customers through a number of contact options. Their website includes a telephone number to contact customer support directly, while also providing a forum where users and prospective clients can discuss Halloo and help each other with unforeseen complications. There are also quick reference guides that can be downloaded if you prefer to solve problems yourself and there are regular newsletters you can sign up to receive that detail new products and services Halloo has in the works.